March Madness gets us excited to root for our college favorites each spring — or at least root for an underdog upset. While it might be hard to predict the perfect bracket, these ideas make it easy to plan a fun March Madness party. Swish! Bracketology - Invite friends to a private online bracket — you’ll have plenty of sites to choose from — and compete for the best bracket. 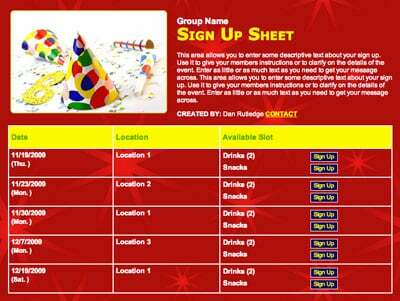 Give small prizes during your party for categories such as overall winner or most upset picks. 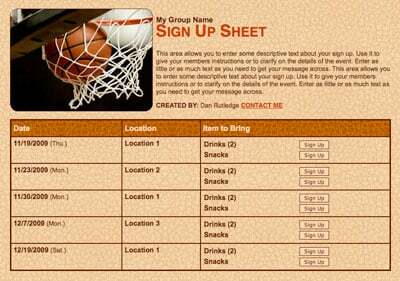 Send Custom Invites - Send customized basketball invites with SignUpGenius to collect RSVPs. Choose from hundreds of stock themes or design your own invitation for a custom look with your team’s colors. Don’t forget to ask friends to bring snacks if it’s a potluck-style event. Booth Review - If your party is opening weekend, set up multiple screens with different games to capture the most of March Madness. You can also stream games live online, so make sure you have a strong Internet connection and plenty of moveable seats. College Colors - Invite friends to wear jerseys or team-specific gear from their favorite college team. See which color dominates the party! Name Tags - With a big group of people, it’s likely some guests won’t know each other. Set up basketball-themed name tags for guests to wear and meet others. Add a fun twist by making people write in quotation marks what their basketball nickname would be. Hoops-themed Playlist - While in-game audio is unquestionably a priority, music is definitely an important piece of a lively party. Plan ahead and create your own basketball-themed playlist to accompany a fun environment. Genius Tip: Need some inspiration? Sports movies usually have great soundtracks — here are 25 classics to browse for inspiration. College Hoops Photo Booth - In a well-lit part of the house, set up photo wall with a basketball court as the backdrop. Print out funny props such as fake mustaches or player’s blown-up faces and pose for fun photographs. Jersey Decorations - Set up plenty of plain white T-shirts and different colored fabric markers in an open area. Have fans design their own jerseys for their favorite team. House Makeover - Design different parts of the house with college team colors. Upstairs could feature Duke blue confetti while the kitchen could showcase Michigan yellow streamers. Basketball Court Table - Purchase a flat and wide rectangular piece of plywood from a home improvement store, and paint it as a replica basketball court. Secure this on top of your regular table to set food and drinks on. Home Team Entrance - Set up lights and special confetti facing the front door to mimic home team introductions when guests arrive. As an added bonus, set up a microphone and speaker to introduce guests as they arrive. (If you have an older child, they may happily oblige to take this duty.) This will help everyone get to know each other! Bracket Whiteboard - Find a large whiteboard and fill in the most up-to-date bracket as you go. As teams win, update the bracket by writing in the winners. Food Free Throw Line - In front of the main table for food, set up colored tape on the ground to replicate the free throw line. Only here, no one is required to make a free throw to get some tasty food (unless you want to set up a toy hoop and make that a party rule). Free Throw Competition - Set up an open hoop outside, and see who can make the most free throws in 10 attempts. Award the winner a mini basketball trophy with a quirky name. Reenact the Favorites - Watch iconic shots from past NCAA tournaments, and have guests try to reenact the wildest shots. See who can pull off that famous half-court heave or off-balance three-pointer to win the game. Dribble Mania - Pick an athlete with a famous dribble sequence, and see who can best mimic that sequence. Record a video of each contestant and compare it to actual footage of the athlete. Basketball Trivia - Create a jeopardy-style trivia game to see who knows the most about March Madness. Research questions like which team has won the most championships or who has scored the most points in a single game. All-Star Line Up - Using all players in March Madness, create your own dream team lineup. Compare your team with others to debate who would win in an actual game. Commercial Vote - During in-game commercials, vote on which commercial you think is funniest and predict which will receive the most votes. Winner gets a small prize! Hoops Movie - Vote on your favorite basketball movie — Coach Carter, Hoosiers and He’s Got Game are a few good ones — and watch the winner during the after party. Hands on Treats - Set up the necessary ingredients for a food competition — including an undecorated cupcake, icing and food coloring. Have guests compete to best replicate their favorite team’s logo. Logo Pictionary - Make a list of all the teams that have competed in March Madness this year. On a blank whiteboard, try your best to draw a random team’s logo, and see who can guess which team it belongs to fastest! Team-themed Foods - Choose a specific food category — such as appetizer, entrée or dessert — and have guests bring the dish with extra flair based on their favorite team. For example, a UNC-themed dessert would feature blueberries or light blue Jell-O, while a Wisconsin-themed soiree could include cheese curds. 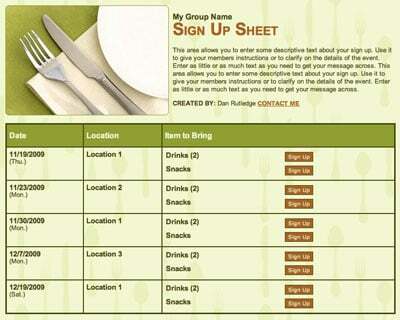 Genius Tip: Create a potluck sign up with slots for each of the food categories. Courtside Drinks - Buy or create your own Gatorade barrel, similar to ones used in basketball games. Fill it up with ice to have your very own beverage station. You probably won’t want to dump it out on the host if the home team wins, though! Name that Dish - Make your creative mark by labeling each dish with a basketball pun. Try “Fast Break Fruit” or “Apple Turnovers” for desserts! Basketball Treats - Bake or buy basketball-shaped treats to accompany your main dishes. Some ideas include basketball-topped cupcakes or hoop-designed doughnuts. Leftover Champion - As the party comes to an end, award the champion of the tournament bracket with first dibs on leftovers of his or her choosing. March Madness Mix - Combine your favorite sweet and salty snacks in a cardboard to-go container decorated like a basketball hoop. Crazy Call - Buy childhood favorite Nutter Butters and decorate them like little referees with black-and-white stripes and eyes using decorative frosting. You won’t need to blow the whistle on this treat! With these ideas, you’re bound for a fun March Madness party. Now, all you need to worry about is how your favorite team will get to the championship.